Home Articles Do You Shoot Human-like Targets? 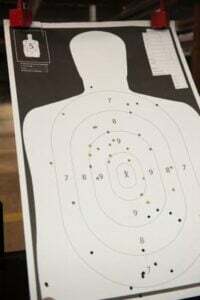 Do You Shoot Human-like Targets? Right now I’m still on the West Coast and I’ve been traveling around Utah and Nevada looking at new shooting ranges to use for future training classes. And the other day while I was inspecting one of the ranges the gentleman who was showing me around said, “You don’t use targets that show real people do you?” I explained to him that I use several different targets throughout my courses and some of them are indeed human-like. When he said that, I almost laughed out loud thinking he was deadpanning some comedy routine, but when I realized he was serious I simply said “okay” and left. The sad fact is, I guess this illustrates, much to my surprise, that all gun people aren’t perfect. Now for people who have common sense, and I like to think I’m one of them, obviously, shooting a human-like target is not going to encourage me to want to go out and kill people. Normal people (like you and me) have no desire to kill another person and will try to avoid it at all costs. The only people who want to kill others are already “messed up” in the head and I’m pretty sure they’re going to kill people whether they’ve been training on human-like targets or bottle-shaped targets. Us “normal people” who carry guns for personal protection need to make our training as reality-based as possible. When someone breaks into your home at 3am and tries to kill your family it’s going to be a person, not a bottle-shaped cardboard silhouette. And if you’re sitting on the range and you get queasy about shooting at a human-like target then carrying a gun is not for you. It’s better you find out now before the gun is taken from you when you hesitate to use it, and instead it’s used on you. The bottom line is, at my pistol courses we shoot at human-like targets because that’s what the threat is most likely going to be one day (it could be an animal too) and you need to train as close to real life as possible. So if your range allows it I encourage you to take a few human-like targets with you next time or if you dry fire in your house you can start dry firing on a human-like target. And if your friends or family members tell you it’s “inhumane” or wrong to use a human-like target, just remember that these will be the same people begging you to grab your gun and protect them when someone’s trying to break into your house or cause them harm.